It's rare to come across a company that is passionate about more than just pushing sales, but about beautiful design and fair business practice too. Sal Design is one such gem. Founded by a Muslim woman of Yemeni and Thai heritage, she provides unique jilbabs which are handmade by skilled tailors in Thailand. I was recently sent the Midnight Gown Cappuccino and the Lemongrass in Denim (which is no longer available on the website, a but there is a similar Lemongrass Navy Blue) to review for the blog. 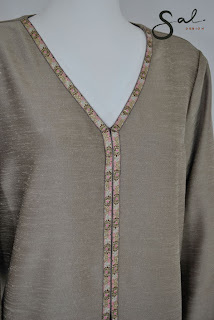 Many of the designs are produced in limited quantities, so some of the finishing varies from one garment to another, hence the difference in the web pictures and mine below. Browsing the site before I received the jilbabs, the designs looked somewhat simple to me. But as I found out, the photos really don't do the garments justice. What stands out for both jilbabs is just how well-made they are. The quality and workmanship is obvious; beautiful fabrics, excellent stitching and a flawless finish. 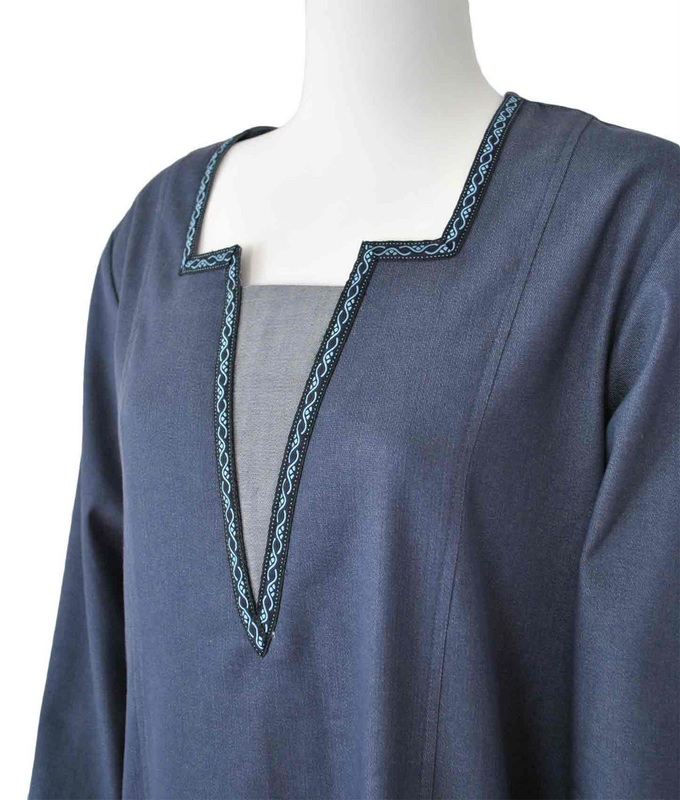 The Lemongrass jilbab is a thick denim-look cotton with lighter fabric and a purple trim around the sleeves and neckline. The Midnight Gown was definitely my favourite; made from imitation raw silk, the fabric has a lovely texture and sheen to it. The jilbab has two layers; at the front the top layer is split to around waist height, with a rich brown fabric underneath. Both jilbabs are tailored to be slightly fitted. I did find however that whilst the fit was generally quite good, they were a little tight around the shoulders. And as I seem to mentioning a lot these days, at 5'3 I found the jilbabs a little too long for me. Both designs have a concealed zip in the centre back. The Midnight Gown, which is available in different colours, is perfect for special occasions like weddings. The design is luxurious, yet elegant and simple. The Lemongrass is more of a casual jilbab for everyday wear. The heavy fabric though would make it more suitable for colder weather. The Sal Design jilbabs I received are beautifully designed and made to last. And though I don't usually comment on price, since I find it quite subjective, I have to say that for the quality of the garments, the prices are incredibly reasonable. Especially considering what other companies are charging for their jilbabs, the Midnight Gown in particular looks and feels like something twice the price. What I would really like to see from the company now is matching hijabs, especially for the eveningwear jilbabs. Love the emerald but they don't see to have many sizes.